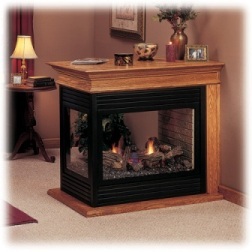 We carry a wide selection of gas (vented and vent free) and wood burning fireplaces including Village Collection and Expression models from Quadra-Fire, and Monessen's Gas Vented and Vent Free Fireplaces/Products. 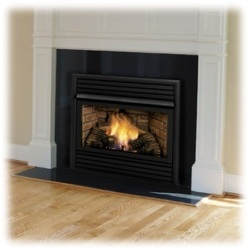 The cast iron gas fireplaces are available in black, and other colors. 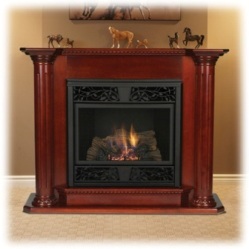 Below is a sampling of the models we carry. 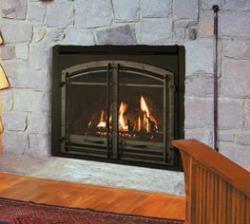 For pricing, delivery, other models and installation please call 508- 969-4844 or submit a contact us form. 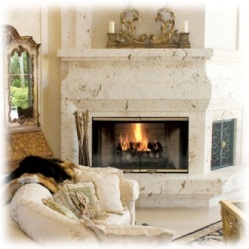 It's hard to imagine anything more likely to contribute to a relaxed winter evening than a Quadra-Fire fireplace. 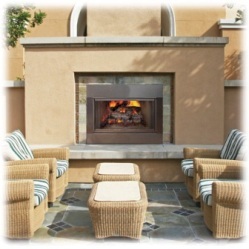 Our hearth products have been known gathering spots to friends and family for years. 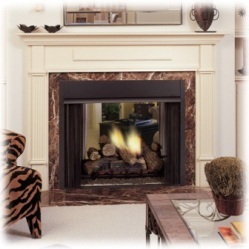 We've listened carefully, combining your thoughts with our best ideas in designing the next generation fireplace, Quadra-Fire's Expression Gas Direct Vent System. Enjoy innovative, on demand performance at the touch of a button, thanks to our intelligent wall control, Intelli-Fire(tm) Plus. Additionally, Firebrick(tm) Technology, the space age material used in our firebox construction, will ensure a lifetime of dependable performance. Advanced features such as one-touch pilot and burner ignition and our patented fireplace Night Light, offer safe and convenient operation that is simply unmatched. 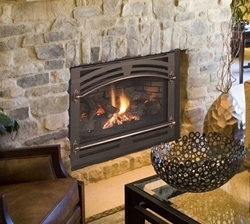 If you are looking for a gas fireplace that is not only wonderfully warming but stylish as well, consider the Village Collection qv36da.A toe and finger warming 26,000-40,000 BTU's an hour will eliminate the need for your family to bundle up in those wool socks and fleece blankets. 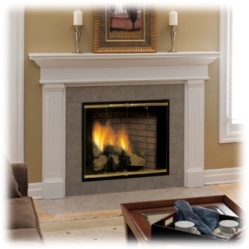 Combining a large, beautiful view, the convenience of gas, and highly efficient heating performance, the QFP44 gas fireplace offers the best of all worlds. Make a stunning statement with a big, bold design in any room, no matter how large the area or how tall the ceiling. 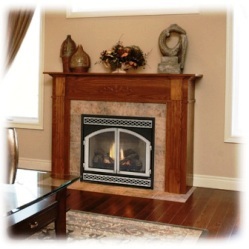 The QFP44 provides an incredible fire view with more than 1400 sq. in. of ceramic glass. The realistic looking ceramic logs are cast from actual firewood, giving the QFP44 the look and feel of a roaring wood burning fire. 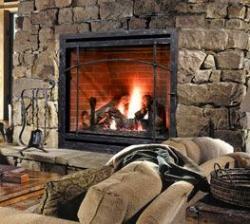 A front flaming coal bed creates the impression that you've just stoked the fire. Add hand-forged andirons and heavy hand-crafted doors and you have a fireplace that is as authentic-appearing as a fireplace gets. 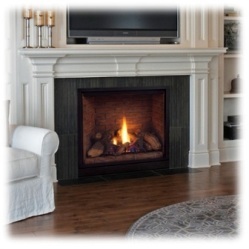 The QFP44 is the largest furnace-rated, single-sided, gas fireplace in the market. 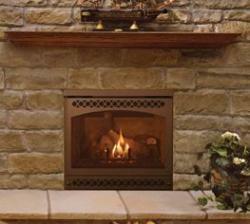 With its powerful two-stage burner, the QFP44 delivers over 70,000 Btu/Hour (NG)—enough to comfortably warm most homes.